After 12 years, the five-member Irish band, BOYZONE, will return to the Philippines, as part of their 20th Anniversary dub "BZ20 World Tour". Boyzone members such as Ronan Keating, Keith Duffy, Stephen Gately, Mikey Graham, and Shane Lynch was formed in 1993 in Dublin, Ireland. They are playing their own version of classic pop songs and original songs which made memorable and gained admiration from countless fans all over the world all over the world including our country. Amidst their popularity, the group split in 1999, after just six years since their group was formed. Most of them pursued individual careers in their homeland either in music or showbiz or both. In 2007, the group made a comeback and made a tour in celebration of their 15th year in the business. In 2009, a tragedy hit the group when one of their members, Stephen, passed away due to a congenital heart defect. But life goes on for the remaining members of the group and that is why for their 20th anniversary, they are making a world tour much to the delight of their countless loyal fans, who continue to admire them and hope to see them once more. 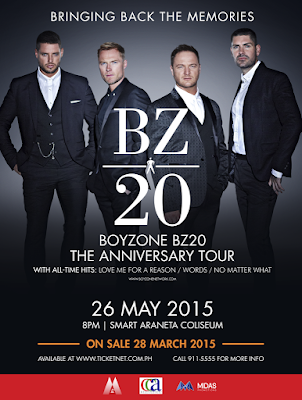 As part of their BZ20 tour or the group’s 20th year anniversary world tour, Boyzone will once again visit and perform in the Philippines this coming May 26, Tuesday, at the Smart Araneta Coliseum to sing their hit songs that won over their countless fans. Front act will be the Harana boys composed of Joseph Marco, Bryan Santos, Marlo Mortel and Michael Pangilinan. Let us all welcome BOYZONE on May 26, Tuesday, at the Smart Araneta Coliseum for tickets please call 911-5555 or visit www.ticketnet.com.ph.